The AAII bull bear spread reached 29.6% on October 28, the highest that has been recorded since 2/22/07 when the spread topped at 31.5%. 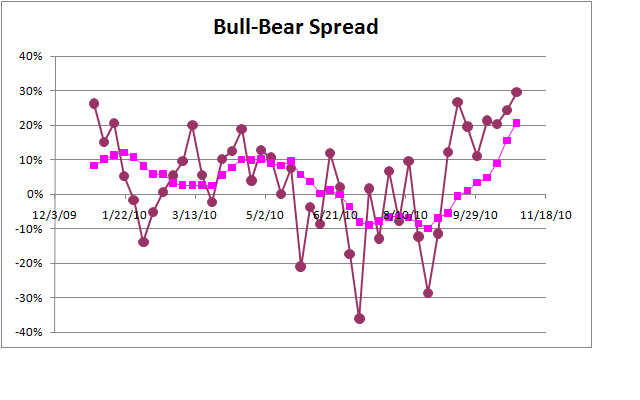 The following graph shows the AAII weekly bull bear spread and its 8-week moving average. From the contrarian point of view, that does not bode well for the general market. This entry was posted in Market and tagged AAII, Bear, Bull, Dow 30, Hui Zhong, Market, Sentiment, Top. Bookmark the permalink.